an email or a photo. Did you know singing nursery rhymes to young children helps them develop early literacy skills? This simple, everyday activity is a great way to help babies and toddlers learn new sounds and words. Sydney Local Health District Paediatric Speech Pathologist Jessica Figueira says using rhythm and rhyme is a fun way to help your child develop good communication skills. “We know children need to have good talking and listening skills before they can develop reading and writing skills later on,” she said. 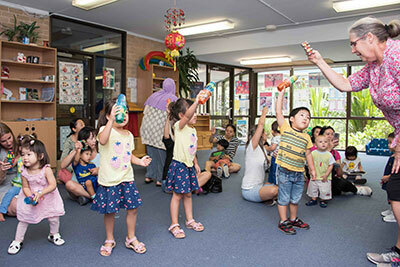 Public libraries across Sydney Local Heath District run free Rhyme Time sessions for children aged up to two-years-old. These sessions introduce young children to the fun of nursery rhymes, action songs and simple percussion, which helps your child to learn more words and develop listening and language skills. If you are worried about your child’s communication development, please contact the Child Health Information Link on 9562 5400 and select option 2. For more ideas about singing and reading to your baby or toddler visit http://ltsrp.resourcingparents.